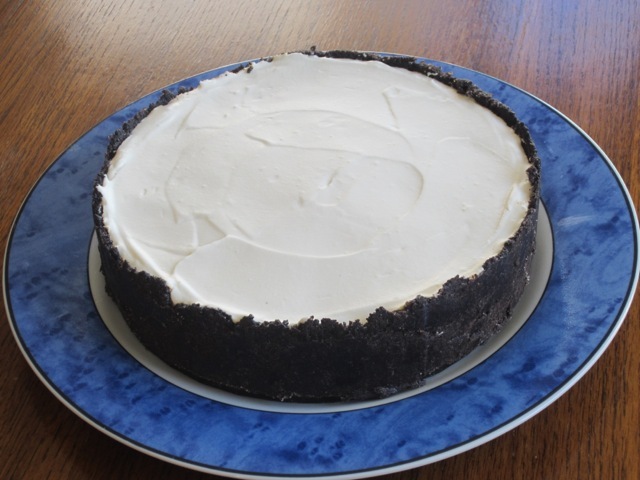 This is a very simple cheese cake that requires no baking at all. 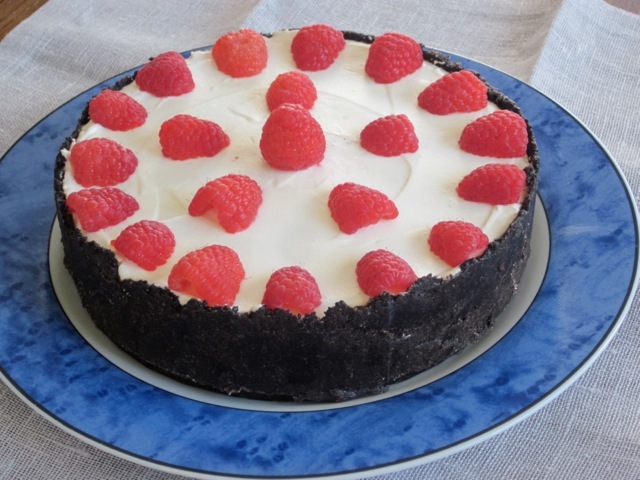 You do need to add some gelatine to help the cake set in the fridge for about 3-4 hours. It’s best left overnight though. The combination of strawberry and chocolate is very nice. It reminds me of the days when I used to melt chocolate and then dip strawberries in the hot chocolate and set it aside to set. It tastes heavenly…doesn’t it? especially if you use a good quality melting, dark chocolate. Good quality ingredients are always so important in cooking!!! How have you been? I’ve been doing some posts offline. I hope you saw the myriads of new posts. Have a fantastic week! 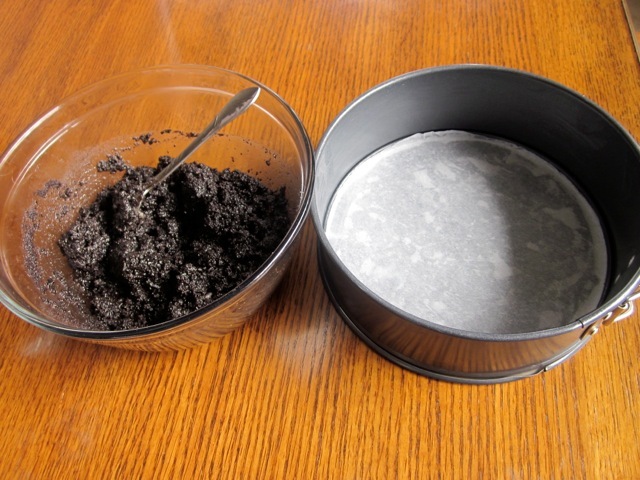 Brush a 7 inch springform tin (pan) with melted butter or oil. Line the base with parchment paper. Combine all ingredients for the base and mix well. Press mixture firmly onto base and sides of prepared tin. Refrigerate 20 minutes. Dissolve gelatine as per instructions and set aside. 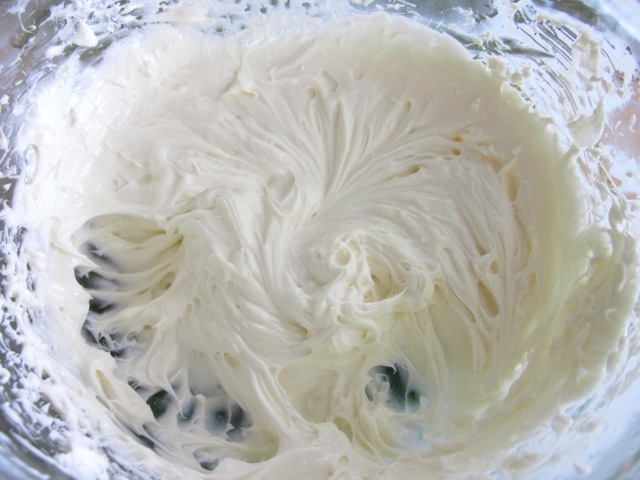 Beat cream cheese with a hand mixer until soft. Add sugar and beat for three minutes, then add lemon juice and beat until blended. 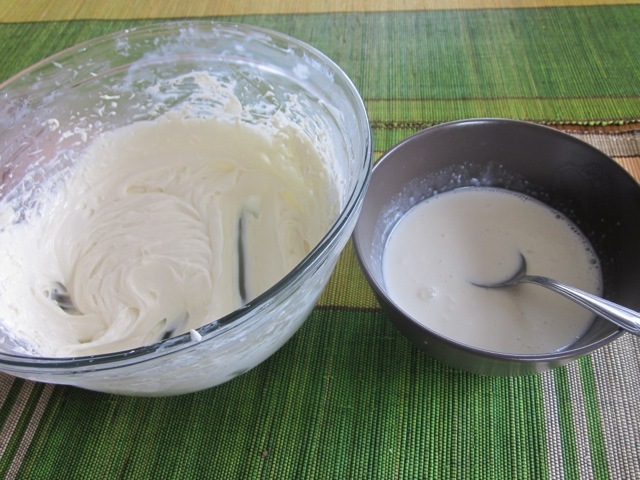 Mix dissolved gelatine with some cream cheese mixture and beat back into it. 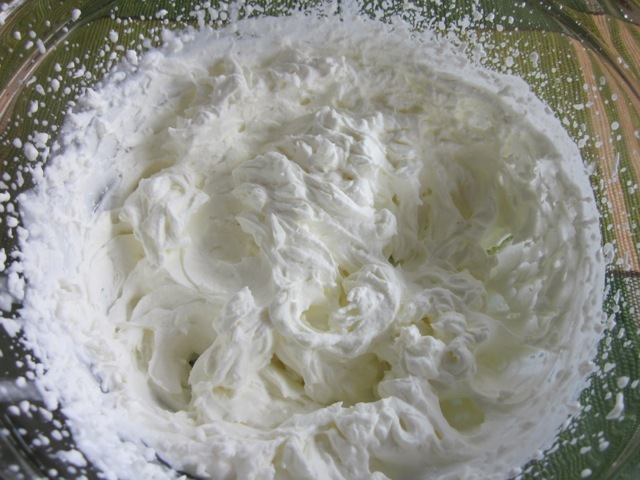 In another bowl, Whip cream until soft peaks form. 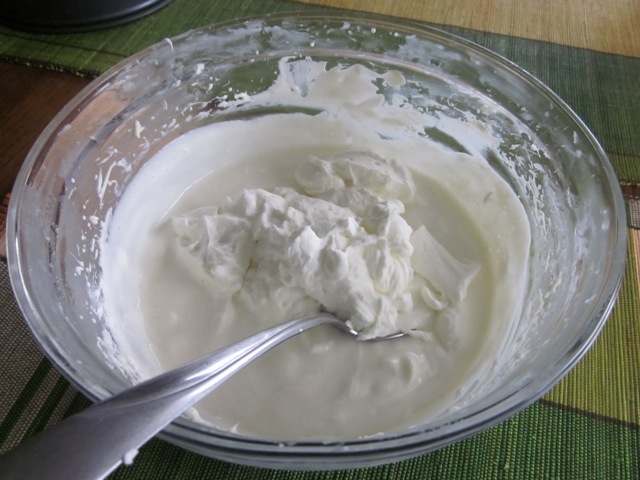 Fold the whipped cream, gently, into cream cheese mixture. Spoon half the mixture into the pan, then top with a layer of strawberries. Spoon remaining mixture on top of the strawberries, smoothen the top and chill three hours or overnight. 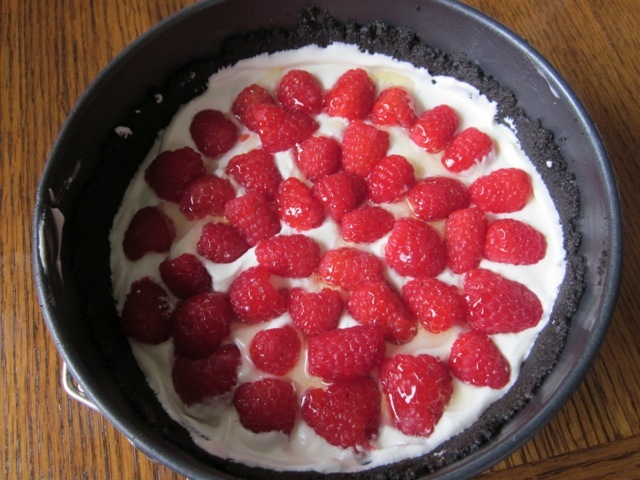 Decorate with remaining strawberries . .
Brush a 7 inch springform tin (pan) with melted butter or oil. Combine all ingredients for the base and mix well. Press mixture firmly onto base and sides of prepared tin. Refrigerate 20 minutes. How to dissolve gelatin: place the 3 tablespoons water in a small heatproof bowl or a microwave proof bowl. Sprinkle gelatin, evenly on the water surface and set aside for about 5 minutes until it becomes spongy. Stand the bowl with gelatin in a container with hot water and stir until the gelatin dissolves or heat in the microwave for a few seconds until the gelatine dissolves. Allow to cool slightly then use. 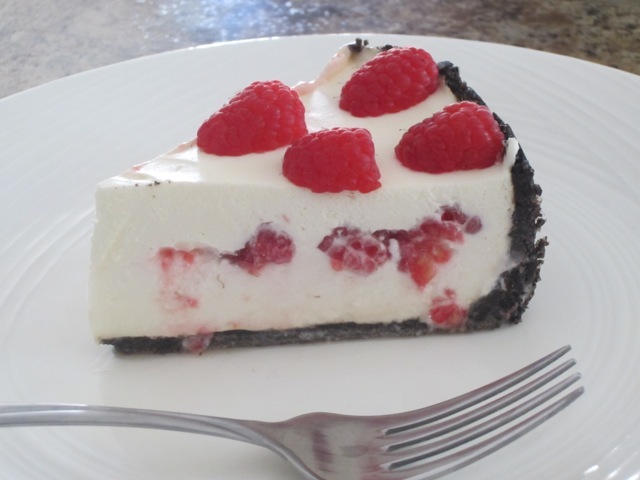 Beat cream cheese with a hand mixer until soft. Add sugar and beat for three minutes, then add lemon juice and beat until blended. Mix dissolved gelatin with some cream cheese mixture and beat back into it. In another bowl, whip cream until soft peaks form. 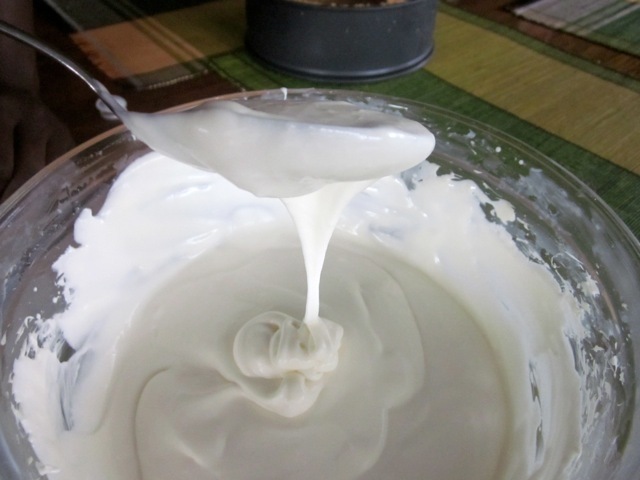 Fold the whipped cream, gently, into cream cheese mixture. Spoon half the mixture into the base of the pan, then top with sliced strawberries. Spoon remaining mixture on top of the strawberries, smoothen the top and chill three hours or overnight. Decorate with remaining strawberries. Serve. You have me drooling, Liz! 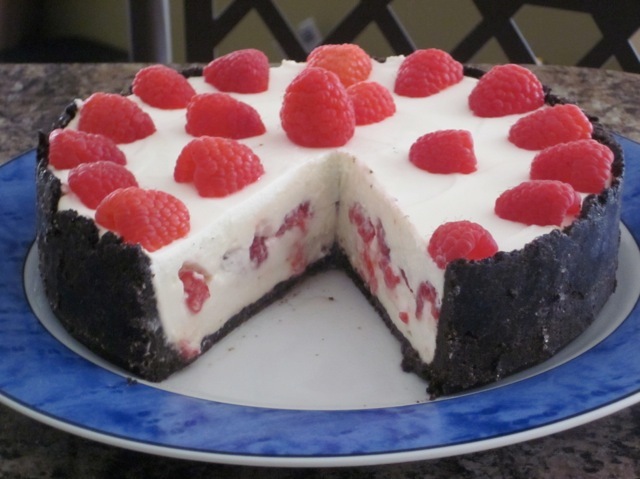 I’ve never seen a cheesecake made like this, but I know I would love it with the addition of cream and the chocolate crust. I really want to try this soon! It so easy to make. You can even make smaller ones. Enjoy the coming week! Looks delish! 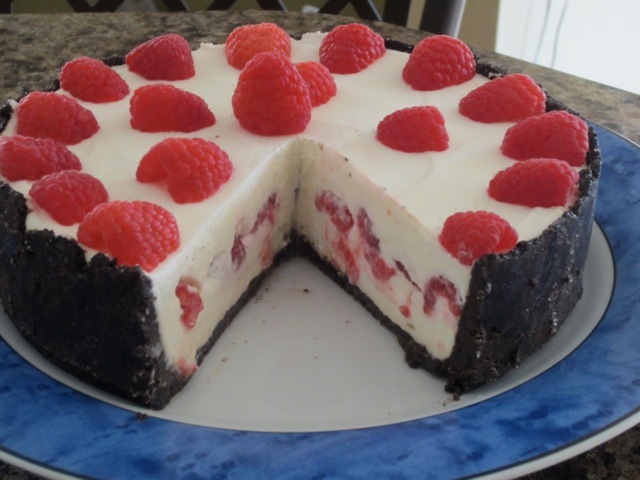 It’s always good to have a no bake cheesecake recipe on hand, especially in the summer. Glad to see all your recipes coming out of the woodwork. Ha ha I’ve done a lot of posts but I need to add photos and post them. I love this because it’s so simple! I used to make this for office potlucks, only with lots of extra lemon. It was easy to spoon over canned cherry or blueberry pie filling at the site. That sounds so delicious. Extra lemon gives extra flavour. I might just try that version of yours. We have a lovely weather today!!! I am just sitting by the window, breathing in all the fresh air….I love it!!!! My daughter is grilling sandwiches for Lunch. mmm..smells good!